October 16, 2018 9:56 am. Mr Stunning has been getting reacquainted with an old partner in recent weeks, with jockey Karis Teetan set to slip his toes in the star speedster’s race-day irons on Sunday (21 October) for the first time since March, 2016. The Mauritian ace, currently hard on the heels of champion jockey Zac Purton in the riders’ premiership, is expecting a bold show in a suitably hot edition of the Group 2 Premier Bowl Handicap (1200m). Mr Stunning claimed the prize last term on his way to securing victory in that December’s Group 1 Hong Kong Sprint (1200m). “I rode him when he was a baby and always knew that he was going to be a Group horse, so I’m glad to be back on him now that he’s proven he’s one of the very best,” Teetan said at Sha Tin this morning (Tuesday, 16 October). 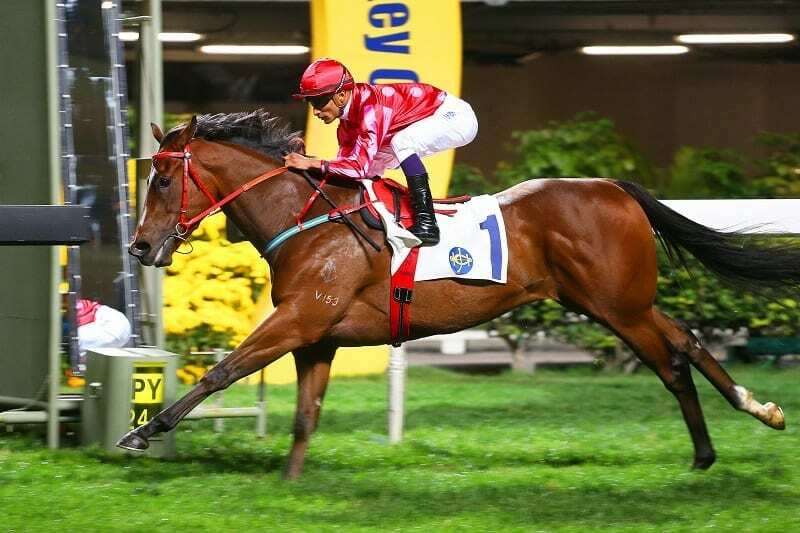 Mr Stunning will clash with former stablemate Ivictory – Hong Kong’s Champion Sprinter, no less – in Sunday’s speed feature. The pair, slated to share top-weight of 133lb, last met when Ivictory leapt from a Class 2 win at Happy Valley to snare the Group 1 Chairman’s Sprint Prize (1200m) by half a length from Mr Stunning. Ivictory stepped out earlier this month with a fine second to the lightly-weighted talent Hot King Prawn in the Group 3 National Day Cup Handicap (1000m) and the latter will be in opposition at the weekend too. Teetan, though, is expecting a good first-up effort from his mount; the bay posted a smart barrier trial effort on 9 October when passing the post in front over 1050m (all-weather) in a time of 1m 03.05s. Also among the entries for the Premier Bowl Handicap are the Group 1-placed grey Fifty Fifty, this season’s HKSAR Chief Executive’s Cup winner Winner’s Way, and the giant grey Pingwu Spark. Sunday’s card also features a top-class edition of the Group 2 Oriental Watch Sha Tin Trophy Handicap (1600m), which has attracted Horse of the Year Beauty Generation and fellow Group 1 winners Pakistan Star, Time Warp, Werther and Beauty Only.